Cut the sausage into rounds and finely chop all vegetables. Saute all ingredients in a pan with a little oil. 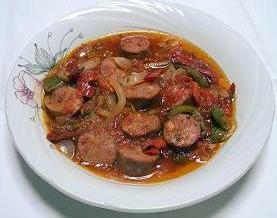 When the vegetables are tender and the sausage is browned add the tomatoes, tomato juice, salt and pepper. A quick dish with strong flavors that can get even more traditional with a few white flakes of grated Mykonian tyrovolia cheese.